Camaro sway bar holes are swaged by piercing the metal and pushing it upwards into a tube shape. On the assembly line, air tools turn the sway bar bolts in and they cut their own threads as they go. The swaged area gives more metal for the bolts to bite into. Smaller 5/16" bolts are used which were strong enough for the small diameter sway bars of the day. The bolt hole spacing is fairly narrow so larger diameter sway bars put the bolt heads very close to the bushing. Frequently, the bolts tear out of the frame and if you drill the hole out to put a larger 3/8" bolt in, there isn't enough metal left to prevent the new bolt from stripping out. Another problem is the frame has a dimple right where the sway bar goes. this dimple sticks up into the frame and prevents a flat reinforcement plate from being used. The inboard half of the frame rail is welded on and there is a mis-match in frame half heights that limits room for a flat plate. I have had good luck with making a flat 3/16" thick plate with 3/8" nuts tack welded on top, then welding washers to it to space the plate up so it does not contact the bump. I drilled the old holes to 7/16" to get rid of the swaged metal. If you drill to 3/8" there will be metal sticking up and you won't be able to get inside the frame to grind it down. Some guys just weld a flat plate on the bottom. I hate to do it that way because it will lower the sway bar and it's already too low for a lowered car. 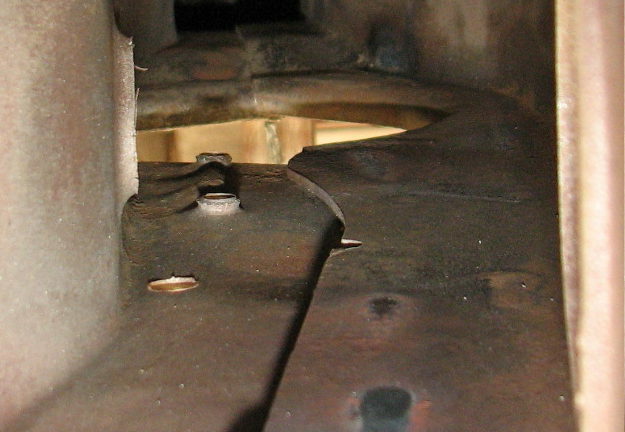 Below are the sway bar holes with a stiffening bump between them. This bump prevents you from putting a flat plate inside the frame rail. These are not rivets sticking up, the frame is punched inward and metal swaged up to form an area the bolts can thread into. 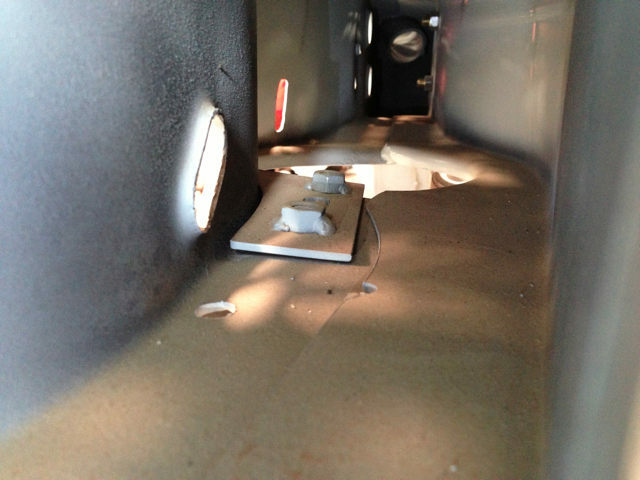 You must drill to around 7/16" to fully remove the protruding metal.